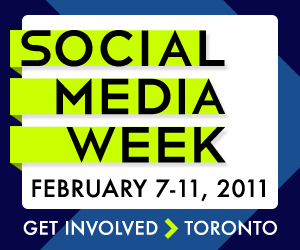 The Social Media Week Series will focus on insights gained from several sessions from Toronto's version of the Feb. 2011 conference. This post will focus on social media and retail. At "The Evolving Role of Social Media in Retail" session at Ryerson University's Ted Rogers School of Management, presenters James Connell and Tanja Zelko of Roots Canada took the audience through several initiatives that their retailer has employed that utilize the social media space in order to grow the business. To view a video of the presentation, click here. Social CRM (Customer Relationship Management) involves using social media channels as a platform for soliciting shopper feedback on an ongoing basis. 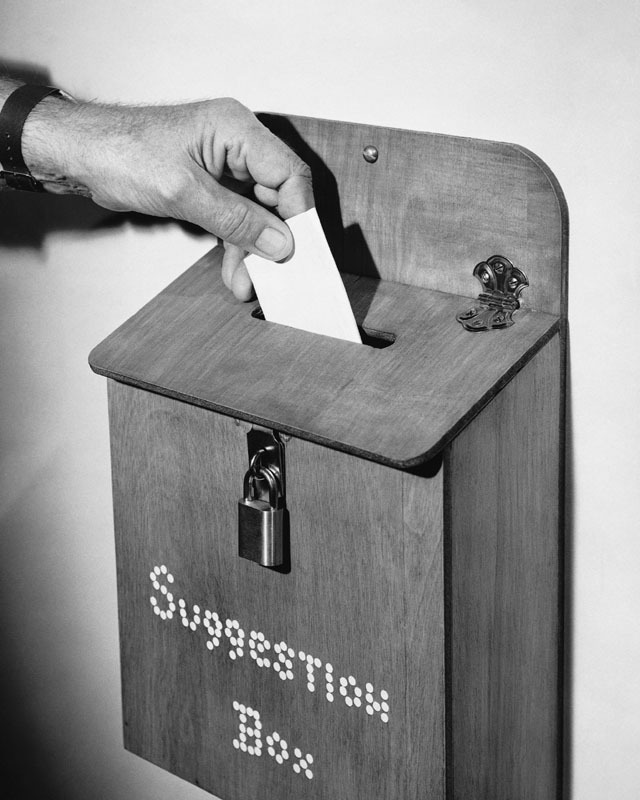 Remember the ol' suggestion box that some retailers used to employ in order to give their shoppers a forum for suggestions and complaints? Shoppers would have to spend the time filling out a form on paper, slipping it into a mysterious box, and walk away not knowing who would read their comment or what would become of it. Perhaps the store manager would one day read the contents of the mystery box, address one suggestion for improvement, and post a positive comment on the employee bulletin board. This form of feedback is now dead; social media channels like Facebook, Twitter, and the retailer's website have changed the feedback cycle forever. Feedback is now instantaneous. Shoppers no longer have to wait while their comment collects dust in a box somewhere - they can now post their point-of-view on a retailer's product or an experience that they had at any time. This is not necessarily a bad thing for the retailer, however, as it works both ways. Retailers now have the ability to react to and address their shoppers' comments and concerns as they happen. Not only that, but retailers can even be proactive in seeking instant feedback from their shoppers: Roots often utilizes Facebook Polls to gauge their shoppers' reaction to issues such as T-shirt sizes and product distribution. Feedback is now public. 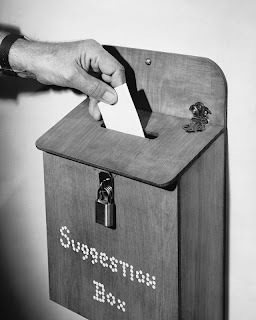 Unlike the mysterious suggestion box, where comments are sent into the abyss and are read and curated by few, feedback in the social media space is entirely public. 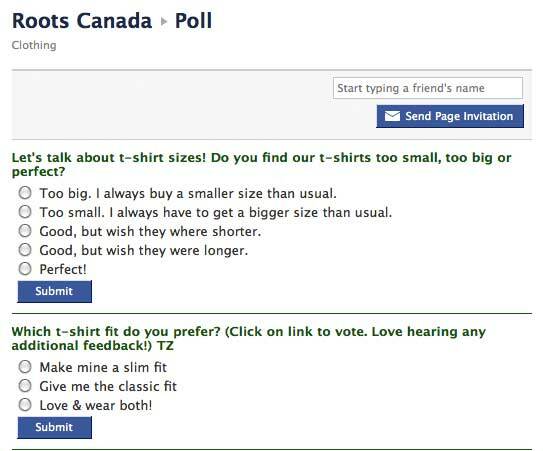 But again, this can work in a retailer's favour - comments can be addressed in the public eye, not only offering an answer to others who may have had similar suggestions or concerns, but showing that the retailer is responsive to its shoppers' comments. 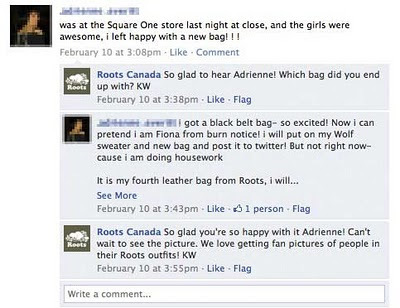 In fact, Roots often encourages its employees to respond to shopper feedback using their own personas (including their photo and their initials) rather than under a corporate avatar, helping them to essentially become the face of the brand. Feedback is now actionable. Not that it wasn't before, but when feedback is received instantaneously and is viewable by the internal and external public, there is a greater opportunity and incentive for someone within the organization to take action on it. 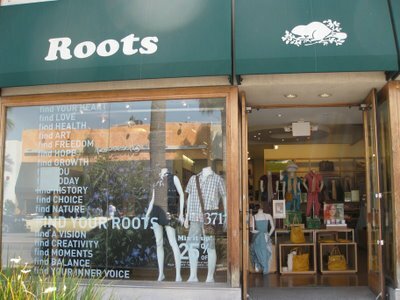 Roots employees work to aggressively protect the brand and its values by reacting to and taking action on complaints. 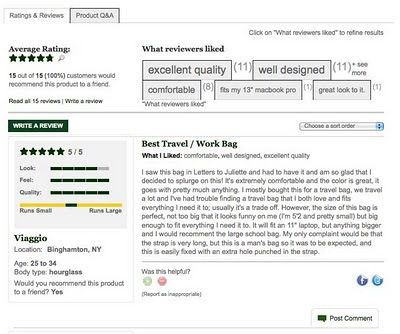 In one case, when shoppers complained about the size of a purse strap, that feedback was relayed to the designers and the factory where the purse was made, resulting in a new strap being shipped to stores. Now that's CRM! Social Branding involves using social media channels as a platform for building the retail brand's image and associations amongst its users. 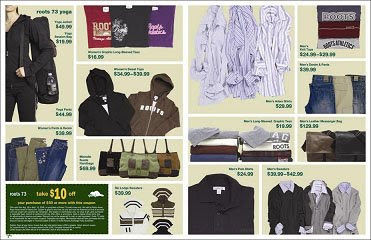 In the past, retailers primarily did this using traditional forms of media, like TV and out-of-home. But this was strictly a one-way affair: media pushed the brand's message to its shoppers, helping to build the retailer's image in their minds. Push media is still important, of course, but so is "fishing where the fish are," so to speak. Social media has changed the rules for how a retail brand can build its image and associations in the minds of its shoppers. It brings the brand to the people. As shoppers spend more and more of their time on social media sites like Facebook, Twitter, and YouTube, it only makes sense for retailers to find new ways of bringing their brand to life in this space. Utilizing the different angles of each of these channels - socializing, spreading information, and video consumption - brands like Roots have found unique ways of building their image online. It allows for long-form, customizable content. Being a slave to a :30 advertising spot is no longer necessary in the social media space - brands can use channels like YouTube to post extended forms of content that can help build the brand. Building Roots' association with Canadian culture, the brand created a series of videos featuring Canadian Olympic gold medalists Tessa Virtue and Scott Moir. In support of Canadian writer/designer Douglas Coupland's new line of Roots merchandise, the brand even created a music video. It lets shoppers help to shape the brand's image themselves. 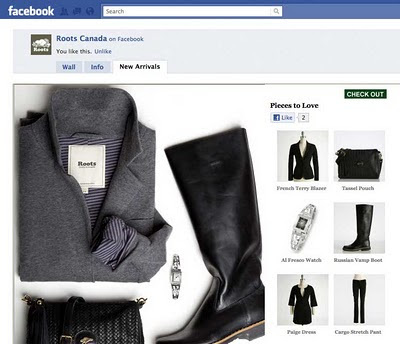 Retailers can use social media as a platform for crowdsourcing brand ideas and imagery from their shoppers. During Canada Day festivities, Roots intercepted passionate Canadians with a Flip video camera and asked them what they thought makes Canada priceless. They then created a video montage of the consumer-generated footage and shared what Canadians thought through social media. Social Commerce involves using social media channels as a platform for sales - both in-store and online. In the past, retailers could only rely on traditional media such as radio and flyers/circulars to create excitement about a new line of products or about a special promotion and drive traffic to their stores. Now, however, social media can be used in combination with traditional tactics in order to drive shopping behaviour - like browsing, window shopping, and deal-hunting - that has a stronger tie to sales. It can create the experience of being in a store. Social media elements like product reviews and group-based deals help to create the illusion that shoppers who are interacting with a retail brand online aren't alone - they're part of a shopping crowd, just like they would be in a store. 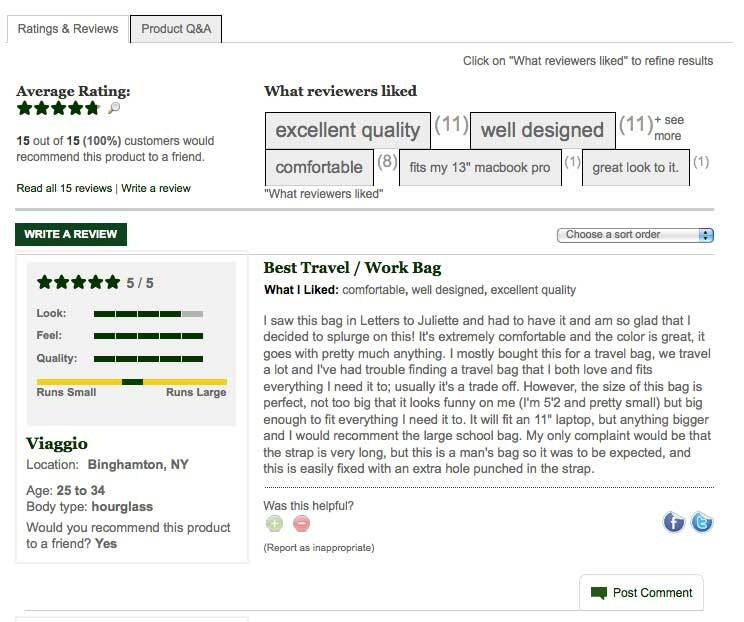 Not only does Roots encourage reviews and comments on its products and in its e-commerce store, it will even update commenters on the status of reviews they've published, making them feel more invested in their contributions. The feeling of shopping together seems to benefit the bottom-line, too: Roots shoppers that interact with a product review are 150% more likely to purchase something, spend more time shopping on the site, and spend more money in total. It can create a sense of excitement and anticipation. Just like circulars and mini-magazines that retailers distribute using direct mail and print, social media can be used as a channel to build excitement about a new line or sale. 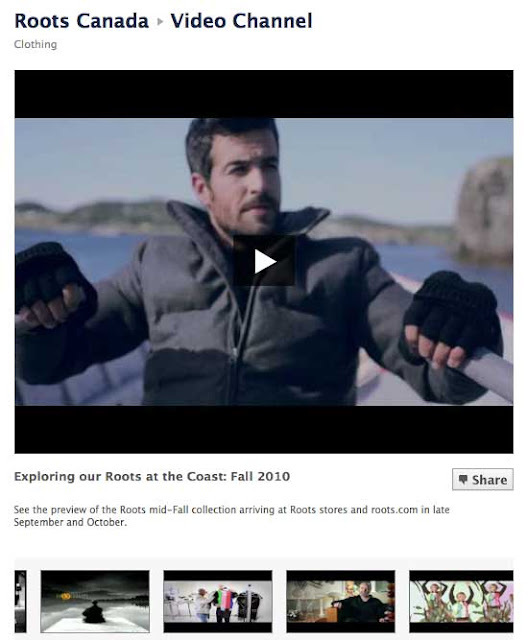 Roots offered up special, exclusive previews of upcoming products on its Facebook page, and created a unique, interactive Facebook Gift Guide app for the holiday season - effectively turning Facebook into a dynamic, richly interactive circular. What do you think of what Roots is doing in the social media space? What other social media strategies would you add to the three outlined here? "This form of feedback is now dead; social media channels like Facebook, Twitter, and the retailer's website have changed the feedback cycle forever." They have and other new ways have emerged thanks to mobile technology. iSuggest lets you submit direct private feedback to business owners from your phone without having to publish everything online on a public forum or social media. This allows customers to help make the places they love better without having to bash them publicly online. Very interesting example, Matt! Thanks for sharing. That brings up an interesting questions: would retailers be as receptive to the customer feedback or comment when it's not public? It's almost impossible to ignore a public Tweet or Facebook comment, but pretty easy to ignore a private message.